← The Tiki Times – June 2017 Events Calendar: Summer season heats up with The Hukilau, Ohana: Luau At The Lake, Tiki Kon and more! * 8 p.m. – Pre-Party in The Molokai Bar at The Mai-Kai featuring DJ James Brown’s Sweat. * 10:30 p.m. – MeduSirena’s After Dark Burlesque Swim Review at The Wreck Bar at the B Ocean Resort. * 2 p.m. – MeduSirena’s South Seas Swimshow at The Wreck Bar at the B Ocean Resort. * 3:30-4:30 p.m. – First Timers Welcome Reception. * 4-7 p.m. – Tiki Tower Takeover in the Pier Top Lounge. Enjoy special cocktails crafted by four world-class bars. * 5:30-10 p.m. – Kickoff Party and Tiki Treasures Bazaar Grand Opening in the Crystal Atrium and Ballroom. Be the first to see all the vendors while you sample rum and cocktails. Live performance by The Mermers. * 8:30 p.m. – Dive-In Movie: Blue Hawaii on the Royal Palm Lawn. * 10 p.m.-1 a.m. – Blue Hawaii Party in the Panorama Ballroom featuring DJ James Brown’s Sweat. * 10 p.m. – The Rat Pack an the Saturn Lounge. Go back in time as the Pier Top Lounge is transformed into a mid-century cocktail party where you can sip Martinis, take in the view, and be entertained by Frank, Dean, and Sammy. * 10 a.m.-7 p.m. – Tiki Treasures Bazaar in the Crystal Atrium and Ballroom. Shop and mingle with the dozens of vendors selling their wares, plus sample rums and cocktails in bars hosted by sponsors. Music by Lounge Laura Taylor. * 10-11:30 a.m. – Craft class: Weave Your Own Palm Hat with Tom Fowner. * 11 a.m.-3:30 p.m. – Okole Maluna Cocktail Academy. Guest bartenders give you tips and tricks on how to make your own Tiki cocktails at home.Guest bartenders give you tips and tricks on how to make your own Tiki cocktails at home. * 11 a.m.-5 p.m. – Rum Island Pool Party. Enjoy cocktails from special guest bars from across the United States. Music by DJ James Brown’s Sweat. * Noon-4 p.m. – Classes: Learn to dance the hula and play the ukulele. * Noon-1:30 p.m. – Symposium: The Mai-Kai’s Untold Stories with Tim “Swanky” Glazner. * 2-3:30 p.m. – Symposium: The History of Rum in 10 Cocktails with Ian Burrell. * 4-5:30 p.m. – Symposium: Black Velvet in Paradise with Ron Ferrell. * 5:30 p.m. – Book and autograph signing in the Tiki Treasures Bazaar featuring Tiki Tony, Tim “Swanky” Glazner, MeduSirena, plus bands such as The Surfrajettes. * 8 p.m. – High Tide Party featuring live music from The Surfrajettes, The Hula Girls, The Mermers, Stolen Idols, Slip and the Spinouts. Burlesque by Angie Pontani, Lila Starlet and Jayne Champagne. Plus six pop-up bars. * 10 a.m.-3 p.m. – Tiki Treasures Bazaar in the Crystal Atrium and Ballroom. Shop and mingle with the dozens of vendors selling their wares, plus sample rums and cocktails in bars hosted by sponsors. Music by DJ Lounge Laura Taylor. * 10-11 a.m. – Craft class: Carve Your Own Pendant with Will Anders. * 11 a.m.-3:30 p.m. – Okole Maluna Cocktail Academy. Guest bartenders give you tips and tricks on how to make your own Tiki cocktails at home. * 12:30 p.m. – High End Rum Tasting with Ian Burrell. * 4:30 p.m. – First happy hour, The Mermers perform in The Molokai. * 5 p.m. – Seating for first dinner show. * 5:30 p.m. – The Surfrajettes perform in The Molokai. * 6:45 p.m. – Announcements and first dinner show. * 7 p.m. – Second happy hour, The Surfrajettes perform in The Molokai. * 8:30 p.m. – Stolen Idols perform in Tahiti dining room. * 9 p.m. – Seating for second dinner show. * 6:45 p.m. – Announcements and second dinner show. * 10:30 p.m. –The Hula Girls perform in the Tahiti dining room. * 11 p.m. – Skinny Jimmy Stingray performs in The Molokai. * Noon to 4 p.m. – The Hukilau Finale at The Mai-Kai featuring three special “lost cocktails” plus appetizers in The Molokai bar and live music by Skinny Jimmy Stingray. * 1:30 p.m. – “The Menus of The Mai-Kai: 60 Years of Tiki Cocktail History,” a special presentation in the main dining room by Jim “Hurricane” Hayward on the history of The Mai-Kai’s cocktail menus and their evolution over time. 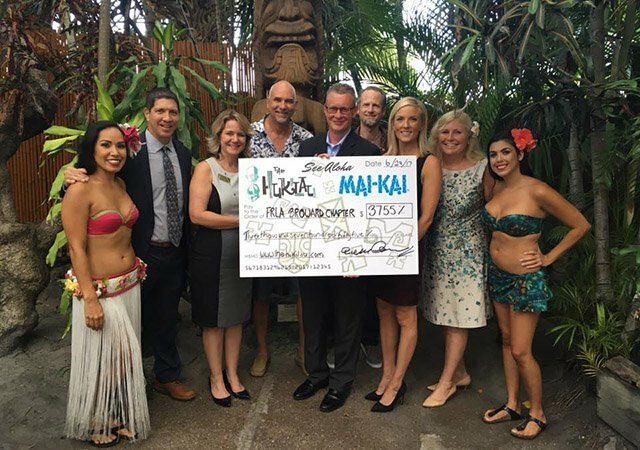 The Hukilau’s “See Aloha” efforts – which included a drawing, silent auction and unique Mystery Drink presentation – raised more than $5,000 for two South Florida charities. As of late June, the total raised was an unofficial $5,677.50, with possibly more to come. Donations are being made to the Florida Restaurant & Lodging Association’s education foundation, and the Miami Dade Reef Guard Association’s mooring buoy project. Money was also donated to aid Mai-Kai fire dancer Mileto to bring his business back from disaster after all his paddleboard gear was stolen. The education foundation of the FRLA works with more than 200 Florida high schools to prepare students for a career in hospitality. Reef Guard aids the installation and maintenance of mooring buoys, allowing divers and fisherman to enjoy reefs without damaging them with their anchors. This entry was posted in 2017, Art, Events, Events, Events, Events, Hukilau, Mai-Kai, Music, Photo galleries, South Florida and tagged Hukilau, Ian Burrell, Mai-Kai, Marina the Fire Eating Mermaid, Pier 66, Surfrajettes, Tiki Tower Takeover, Wreck Bar. Bookmark the permalink.